The Met’s first revival of Willy Decker’s production of La traviata brought us the fragile charms of Natalie Dessay in the title role. Did she conquer the sofa that made Anna Netrebko (in Salzburg) a star? Verdi, La Traviata. Met, 4/18/2012. 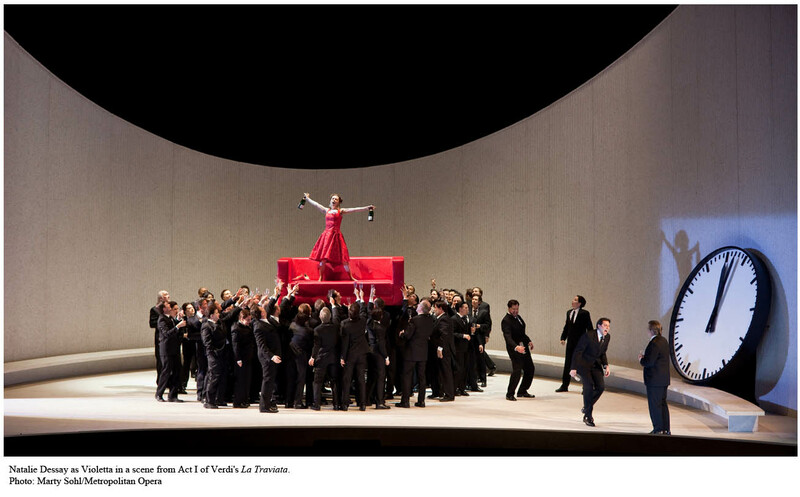 Production by Willy Decker (revival), conducted by Fabio Luisi with Natalie Dessay (Violetta), Matthew Polenzani (Alfredo), Dmitri Hvorostovsky (Gérmont). Since I was away last season, this was my first time seeing the production live, though I knew it from the famous Netrebko/Villazón Salzburg DVD. I like it very much and I can’t help but cheer to see Met people lined up around the block to see a production where a man in a dress and a mask suggestively rubs the minute hand of a giant clock, you know? It warms my heart. Also, it is just a really, really good staging. Decker’s is a stylized, bleakly unsentimental interpretation, pared-down and extreme. It’s the opposite of the old Zeffirelli production, whose heavy upholstery tended to dampen any excessive displays of emotion and absorb even the most charismatic of singers. Here, Violetta is starkly isolated, her red dress the sole splotch of color among the anonymous hoards of men who pursue her. Maybe the giant clock counting down Violetta’s days and the hovering figure of Dr. Grenvil (AKA Death) aren’t subtle, but the imagery is striking and beautiful. (I’m not going to summarize it in any more detail because its virtues are, by this point, well known.) The staging requires real presence in this title role, and yet rewards a star Violetta in a way that Zeffirelli’s production never did. Natalie Dessay was getting over something and by all accounts had a better outing last night than she did at previous performances during this run. She got off to a rough start, sounding tentative and having trouble staying with the inevitable Fabio Luisi and the orchestra. By “È strano,” she had stabilized. But her voice is still a thin and silvery thread, limited in its scope and color. Her only real variation is a breathy quality, which gets old quickly. Floaty high notes made the letter aria her best moment; the coloratura of “Sempre libera” was fast but not overly accurate. But in the ensembles and everyone’s favorite outburst, “Amami, Alfredo,” she came up well short in volume. (She did sing the high E-flat at the end of Act 1, and it was far too long and loud. I like this interpolation at times, but the fermata was way over the top.) She got to the ends of the phrases but rarely sounded more than wispy, and sometimes rhythm and phrasing, and even intonation, seemed slapdash. Her acting was similar in tone, a damaged Violetta only barely making it through rather than the physically weak but psychically joyous interpretation Netrebko brought to this production. 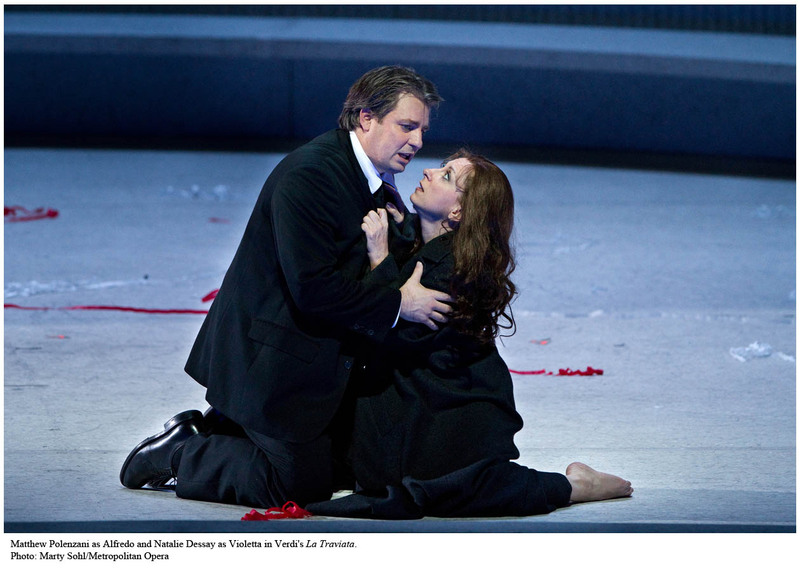 Netrebko’s voice spoke to Violetta’s strength of spirit, Dessay’s voice speaks to the decay of her body. Maybe this is appropriate for Violetta. It’s a special and poignant kind of pathos when the failings of the singer become the failings of the character. (Begin theoretical digression:) Regular readers of Critical Inquiry may remember Carolyn Abbate’s article on analyzing opera in performance that used a similar incident as an example of a highly charged performative moment, namely the cracktacular Ben Heppner’s struggles to get through the Prize Song. His heroism to stand up in front of an audience while his vocal apparatus repeatedly failed him, according to this argument, sort of put the Helden- in Heldentenor. * Traviata is a little different: Violetta’s frailty and Dessay’s own weakness are complementary while Walther isn’t supposed to be struggling. But I don’t buy this argument. Poor Heps’s first few cracks might have been something special, but if they kept coming eventually a crack is just a crack, not a transformative performative act. An opera can have these moments, but it also has a narrative arc that extends through the evening. (End theoretical digression.) And a Violetta whose sole affect is fragility is too one-sided an interpretation to convince me. It’s a rich, complex character, and I found Dessay not varied enough. Matthew Polenzani sang Alfredo wonderfully, with inventive phrasing and consistent beauty of tone. But acting-wise he’s awkward. This could work for the character (I’ve seen it done intentionally by others), but it’s a problem of this sort of production: it was originally designed for the more shameless and impetuous Rolando Villazón. Polenzani is obliged to follow this mode, and he wasn’t selling it. 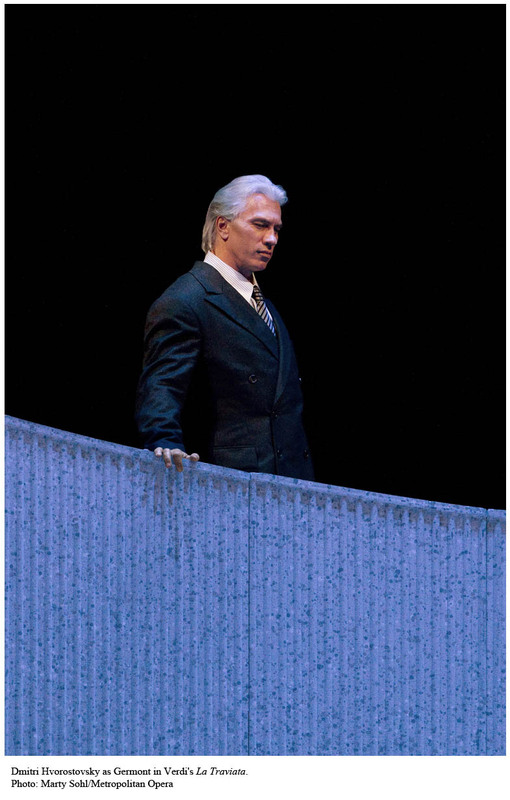 As Papa Gérmont, Dmitri Hvorostovsky radiated stolid gravitas. Vocally, he has the range of about a fourth in his voice that sounds just spectacular, from around an A to a D at the top of the staff. Below that sounds growly and above it forced, but a lot of “Di Provenza” sits right in that velvety sweet spot and he has got the legato and it sounded wonderful. Unfortunately the duet with Violetta is a little lower, and didn’t sound as good. Fabio Luisi conducted a self-indulgently slow prelude (as an old teacher of mine said, “you’re supposed to make them cry, not point out to them that they’re supposed to be crying”) but mostly kept the orchestra in line for Dessay, entertained Polenzani’s unusual staccato approach to the beginning of “De’ mei bollenti spiriti,” and was elsewhere not too sugary. The orchestra didn’t have any problems, and the chorus sounded fine with only a few mild coordination hiccups. The stage direction of said chorus is not quite as tight as it could be, but I’ve seen far worse. Despite this less than completely convincing assumption of the title role, I’m still very glad I finally got to see this first-class production. Somehow I doubt the Met will ever be able to originate a production of a warhorse opera that is this of this quality, but I’m glad that it made it to New York eventually. 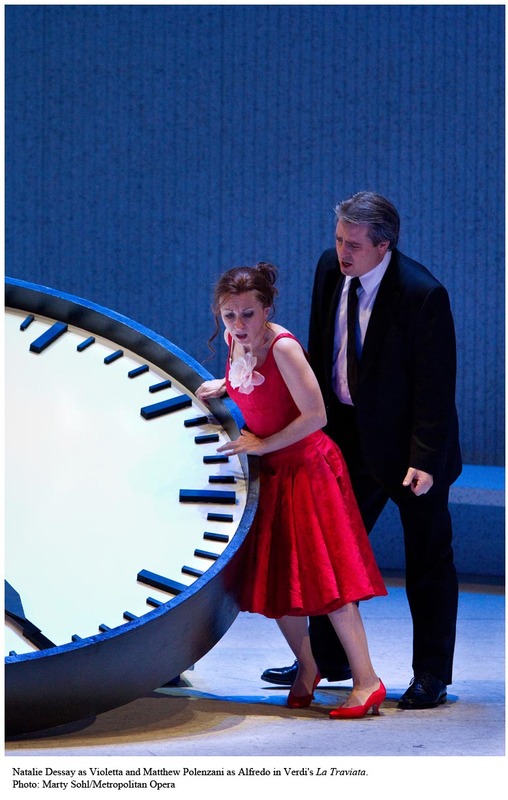 La traviata continues through May 2. *Yes, this is the same article I cited in both my Spring for Music entries. It’s going to be for me what Seamus is to Gail Collins. Doesn’t sound too different from Vienna. The breathiness got to me as well, and the E flat being squawked for an eternity isn’t something I’ll forget easily. But it wasn’t all bad. I love that you bring in Abbate here! There is however a broader Preislied conclusion she comes to which you don’t mention (?). I may be wrong, it’s been some years since I read the article. My cue to revisit it was an upcoming Gerontius with the Hepster himself, which might have led to some kind of rip-off in my review (with ‘Sanctus fortis’ how could it not? ), but unfortunately he’s cancelled. Really excellent review, thanks. I don't buy the Abbate argument either. You nailed the problems with Hvorostovsky in Verdi exactly right. We've had Polenzani only once in SF, where he was a breathtakingly beautiful Belmonte. He is back this coming season…in Hoffman with Dessay. Perhaps she will be taken ill for all of June, 2013.